Anacostia, Collections, Community History, D.C. The Anacostia Community Museum offers unpaid internships year-round to students enrolled in undergraduate and graduate programs who wish to learn and gain professional experience in various fields including archival science. Here, our 2017 summer intern, Shannon Wagner shares her experience processing the Fractious Family papers. I spent my internship processing a collection of papers that document the lives and achievements of several generals of the Fractious family of Washington, DC. The collection was minimally processed using some suggested guidelines in the archival science article “More Product, Less Process: Pragmatically Revamping Traditional Processing Approaches to Deal with Late 20th-Century Collections” by Mark A. Greene and Dennis Meissner (2004). The authors suggest a processing strategy that takes less time while focusing on the most important parts of the collection to reduce backlogs and provide faster access to archival collections. Using the museum’s processing guidelines and in accordance with Frederic Millers’ processing suggestions, I removed “metal fasters such as rusting staples. . .” and other harmful elements to the collection. Photocopies and folded papers were flattened, certificates were placed in protective mylar sleeves to prevent tearing or bending, and photographs were separated from papers. 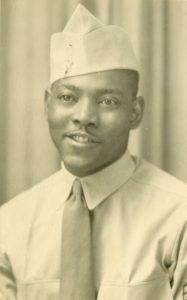 Processing this collection was a great way to enhance my understanding of preserving archival materials and the technical side of archival work, while also learning about life in the the Anacostia neighborhood in the 1940s and beyond. I found the correspondence in the collection by far the most interesting; it includes over 100 letters written between 1917 and 1948. Most of the letters were written during WWII (1939-1945) between Blanche Queen and her future husband, Robert Fractious. Fractious Family Papers, bundle of correspondence pre-processing. Photo by Shannon Wagner. 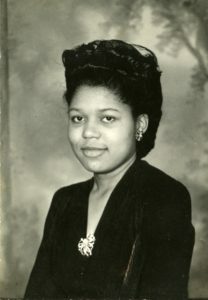 Besides documenting momentous events in her letters, Blance describes daily life and events such as weddings, deaths, church gatherings, and various happenings in the community. Fractious Family Papers, collection post-processing. 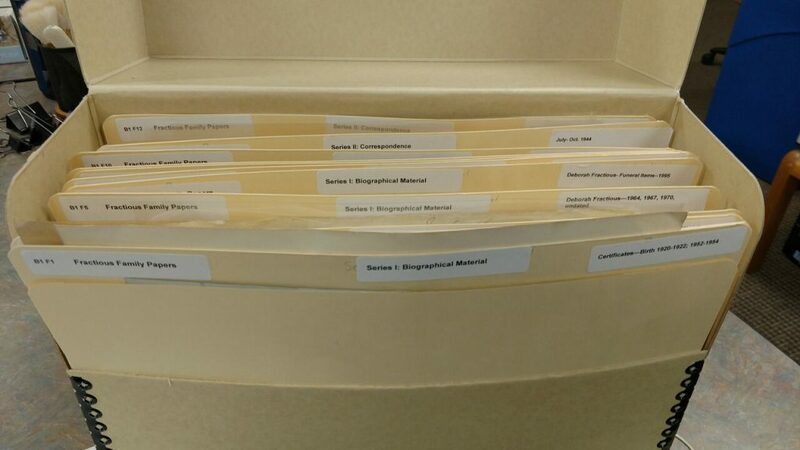 Items organized in acid-free folders in archival boxes. Photo by Shannon Wagner. The Fractious Family papers offers a wealth of information about the everyday life experiences of Washingtonians during WWII. The correspondence is fascinating but there are also photographs and other materials in the collection that document family and community life. I’m happy I had a role in making this collection accessible to the public! Fifty-nine years ago today, Curtis Brothers Furniture Company declared July 25, 1959 Big Chair Day to celebrate the oversized chair that stood as a conspicuous advertisement in front of their showroom at the corner of V Street and Nichols Avenue (now Martin Luther King Jr. Avenue) in southeast Washington, DC. 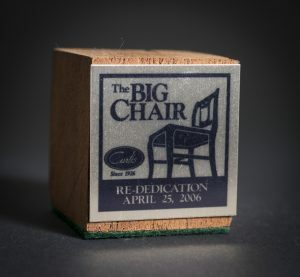 A piece of the original Big Chair is in the Museum’s collection, bearing testimony to one of the Anacostia neighborhood’s most famous landmarks. Modeled in the Duncan Phyfe style and crafted out of mahogany, the 19 ½ foot, 4,600 pound chair was installed atop a four foot high concrete pedestal with a plaque touting it as the “World’s Largest Chair.” It took skilled laborers from Bassett Furniture Industries 900 hours to construct it in late 1958, and once erected, it became an immediate attraction, drawing visitors from all over the city. 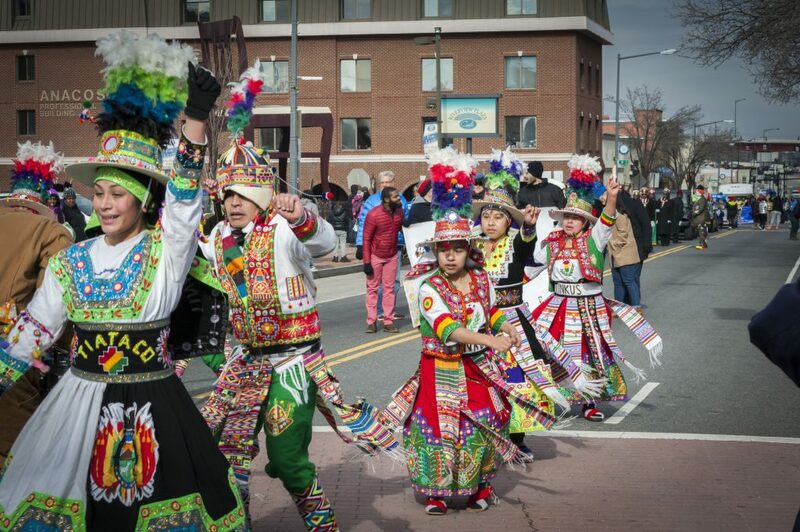 January 16, 2018 – Bolivian dance troupe Tinkus Tiatako dances near the Big Chair sculpture during the annual Martin Luther King Jr Day Parade in historic Anacostia. The Curtis Brothers Furniture Company capitalized on people’s curiosity and celebrated Big Chair Day extravagantly with a carnival-like atmosphere. The company gave away furniture and other prizes, offered pony rides for children and orchids for women, hosted live music by The Buckskins, and offered free photographs of customers with the Big Chair. The crowning moment of Big Chair Day 1959 was the coronation of Maureen Reagan, daughter of future President Ronald Reagan, as Miss World’s Largest Chair. 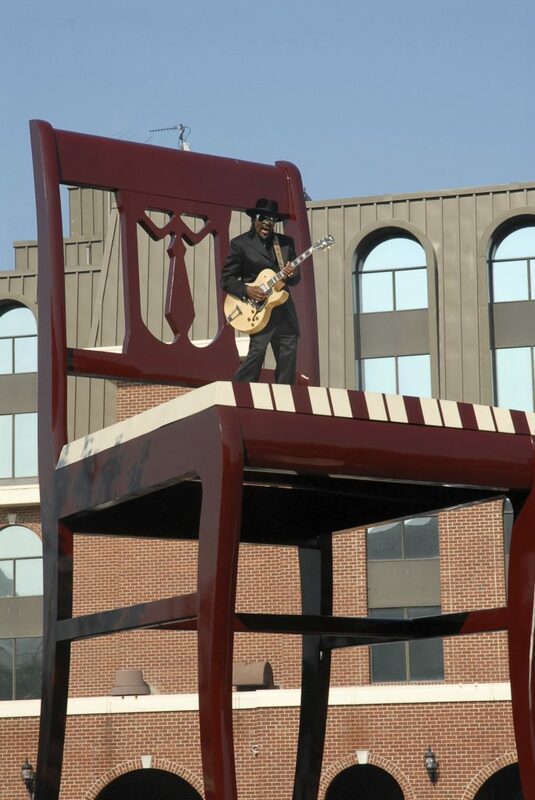 Chuck Brown performing atop the Big Chair. As befits a landmark, the Big Chair has shown great longevity. Although the original mahogany frame had to be dismantled in 2005 due to weathering, a new Big Chair was quickly erected in the same location, largely funded by the Curtis Investment Group. It was unveiled on April 25, 2006, in front of 250 invited guests, civic leaders, and politicians, including then-Washington, DC Mayor, Anthony A. Williams. The new Chair is cast proportionately to the original, but made of 2,600 pounds of painted aluminum, which requires less maintenance and lasts infinitely longer than wood. It continues the tradition of anchoring the community and standing as a landmark of Anacostia. As to the remainder of the original Big Chair, the discarded mahogany was cut into souvenir blocks, one of which was eventually donated to our Museum. Though a simple wooden block, it carries the weight of a neighborhood’s history – conveying some of what the Big Chair has meant to Anacostia in the six decades since the Curtis Brothers Furniture Company crafted it to draw in customers. The Evening Star (Washington, DC), July 24, 1959, sec C, 20. Newsbank Inc., (accessed July 17, 2018). The Evening Star (Washington, DC), December 21, 1959, sec A, 4. Newsbank Inc., (accessed July 17, 2018). “Model Gets Her Feet On the Ground Again,” The Evening Star (Washington, DC), September 24, 1960, sec A, 8. Newsbank Inc., (accessed July 17, 2018). Paul Schwartzman, “The Return of the Big Chair: A Very Big Deal,” The Washington Post, April 26, 2006, http://www.washingtonpost.com/wp-dyn/content/article/2006/04/25/AR2006042501682.html (accessed July 17, 2018). Sandra Fleishman, “It May Not Be the Biggest but It’s Ours,” The Washington Post Magazine, November 23, 1986, 17-18. Proquest Historical Newspapers: The Washington Post (1877 – 2001), (accessed July 17, 2018). 2018 marks the bicentennial of abolitionist and civil rights activist Frederick Douglass, whose Cedar Hill Estate is located one mile from our museum’s current location. In his honor, collections researcher Meghan Mullins showcases a portrait that was created by one of our museum’s early employees, artist Larry Erskine Thomas.